Originally, what became Woodhenge was first discovered in modern times during the first half of the nineteenth century, as ‘earthworks’ thought by some archaeologists of the time to be a disc barrow. It had been named Dough Cover, surely the first reference to the site’s henge shape. In 1926 Woodhenge’s discovery was amongst the first triumphs of the new science of aerial photography, and the site was first positively identified from an aerial photograph taken by Squadron Leader (later Group Captain) Gilbert Insall, VC, in 1926, during a survey of Wessex by Alexander Keiller and OGS Crawford. 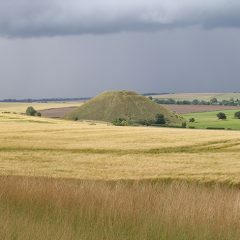 Keiller later undertook the pioneering restoration work at Avebury, during the 1930s, and Crawford was Archaeology Officer for the Ordnance Survey and later became the editor of Antiquity. Having recognised the importance of the site, renowned archaeologists Maud and Ben Cunningham immediately began work excavating the site, and by 1929 their survey report confirmed that it was indeed a henge. In 1958 and again in 1973, Alexander Thom undertook a survey of the Woodhenge ‘bollards’, a simplified version of his original plan of the site appearing in Megalithic Sites in Britain (Oxford, 1967, p74) site. His original site plan is reproduced below. Thom wrote that a ‘very careful survey’ of the site, ‘using steel tape and theodolite, was made of the concrete posts which the excavators placed in the post-holes in the chalk’. He then linked the site with Stonehenge astronomically by pointing out that the axis of the site aligns to ‘the point on the horizon where the midsummer sun first appeared about 1800 BC’. The calculated ‘first flash’ azimuth is indeed 49.2 degrees when the given figures for the latitude of the site and horizon altitude are entered into the standard formula (see below). A hawk-eyed reader may spot that on the plan published in MSIB the solstitial sunrise is given a declination of 24.2 degrees, which corresponds to a date around 4800 BC, far too early for all dating estimates of Woodhenge. 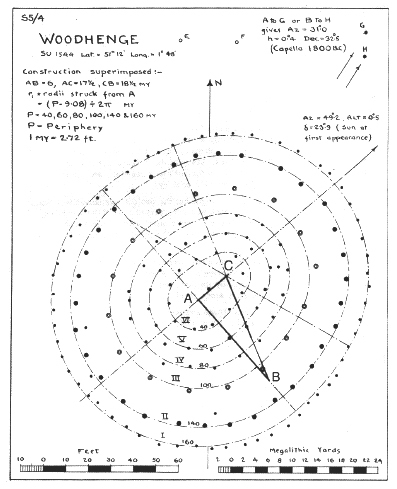 The original plan (above) gave the declination in Thom’s own handwriting, at 23.9 degrees, and a theodolite measured horizon altitude of 0.5 degrees. QUICKAZ – Finds azimuths in a flash! The proposed sunrise is in the NE quadrant. The geometry of Woodhenge is shown to be one of a family of designs which mostly occur on the western side of Wales (Castell Mawr and Hirnant), and in Brittany. The various arcs are struck from the points of a triangle, usually of integer side-lengths and Pythagorean (right angle triangles). Sometimes the ‘blunt end’ is semi-elliptical (Castell Mawr) rather than semi-circular (Woodhenge). The plan of Woodhenge given above shows the design to be based around a 12:35:37 Pythagorean triangle, from whose corners the various arcs are struck to define the perimeter. The arcs at the blunt end share a common centre at A, whilst those at the sharp end share a common centre at C. The measured distance between A and C is 6 megalithic yards (2.72 feet), which makes the triangle 12:35:37 in units of half a megalithic yard. From point B the flatter arcs are struck to then complete the perimeter. Woodhenge consists of a set of concentric arcs struck from each point of the triangle, with one gap (see plan). It is the perimeters which reveal the true nature of the design. While the radii are not integral multiples of the megalithic yard, the perimeters turned out to be of lengths close to 160, 140, (gap), 100, 80, 60, 40 megalithic yards. For each ring the radius of the arc at the ‘sharp end’ is 1 megalithic yard smaller than that struck from the ‘blunt end’ (MSIB Table 6.5 shown below, author’s commentary in brackets). Thom noted that there were deep ramps to all the holes of ring III, and that the holes averaged at 2.88 feet diameter (7.839 feet). He concluded that very large posts had been used, ‘carrying perhaps a platform or roof‘ [or maybe a bluestone or two?]. He further noted that the ring was 4 per cent larger than expected, and that holes of the above larger diameter would assure ‘the inside of the structure would be a perfect fit‘. Neglecting ring III, Thom applied his statistical methodology, designed by mathematician and statistician Dr Simon Broadbent, to find from the values of P(actual), the value of the megalithic yard which best fits Woodhenge. This turned out to be about 2.718, a value so close to his later value for the megalithic yard ( 2.722 feet) as ‘to show that we can be quite certain we are using the identical geometrical construction to that used by the builders‘. To briefly digress, when I was staying with the Thom family in preparation for writing the biographical account of Thom’s life and work (Alexander Thom: Cracking the Stone Age Code, Bluestone Press 2007) the full nature and extent of the excoriation this pioneering archaeoastronomer had endured from the negative reaction to his work from many mainstream prehistorians and archaeologists was laid bare in front of me. This became known within archaeology as ‘Thom bashing’ and ‘Thomfoolery’. However, some of the leading prehistoric archaeologists of that time (Atkinson, Burl, Case, MacKie) were both amicable and quite accepting of his work and studied the implications of accepting the claims Thom had made concerning the capabilities of Neolithic megalith builders. What was also painfully true was that many of his most vehement critics were neither equipped nor qualified to assess the numerical nature of Thom’s findings. Interested readers can glimpse the nature of this energetic debate – a fascinating vignette of a true pioneer who arrived on the scene during the most turbulent time in the recent history of archaeology – by watching the archived 1970 BBC ‘Chronicle‘ documentary, Cracking the Stone Age Code, available on the web (search ‘BBC archive Chronicle Thom’). They do not make documentaries like that any more. Thom first surveyed Woodhenge in 1957-8 while he was still professor of Engineering at Brasenose College, Oxford. By the time of the 1973 Stonehenge surveys he had retired and moved back to the family farm (The Hill) in Dunlop, Ayrshire. He enjoyed full assistance during that work from his son, oceanographer Dr Archibald Thom, professor Richard Atkinson, Stonehenge custodian Major Lance Vatcher and members of the Survey Branch, Royal School of Artillery. His report first appeared in the Journal for the History of Astronomy, Vol 5, part 2, No 13, June 1974), and a version of this paper later appeared in Megalithic Remains in Britain and Brittany (Thom and Thom, Oxford, 1978). It dawned on me while working on the relationship between Stonehenge and Woodhenge that Alexander Thom is probably the only individual who has ever undertaken an accurate survey of both monuments. I was particularly aware of this during a trip to the Stonehenge landscape with John Michell in 2003. While setting up a theodolite on an anonymous barrow some 3700 feet from Stonehenge, I noted that all three sites lay on a straight line connecting Stonehenge with Woodhenge. When I returned in 2014 (with a better theodolite) I had more time to study this linearity and its relationship with the sky and landscape. The centres of the two henge sites are spaced 10033 feet apart. Defining the centre of Stonehenge is rather harder to estimate than for Woodhenge, due to each phase of the former monument having a slightly different centre than the others (Thom, JHA 1974, op cit). I used the crossing point of the two diagonals of the station stone rectangle, as shown below ( lower left). The measurement is from Google earth, and estimated to be accurate to within two or three feet, based on a normal surveying practice of defining a previously laid out base line, in this case the measured distance between the eponymous Cuckoo stone and Woodhenge centre, some 1350 feet in length, and using Google earth to compare the accuracy of that already known length with the length delivered by GE for the unreachable (out of bounds) centre of Stonehenge! The azimuth or bearing of this line, looking from Woodhenge to Stonehenge, is 247 degrees and 23 minutes, obtained from a sun-shoot. Looking up the line from Stonehenge, this azimuth angle (the angle between north is 67 degrees and 23 minutes’, and the angle from the white east-west line (illustrated above) is therefore 22 degrees 37 minutes). This is significant, for it is uniquely the acute angle of a Pythagorean 5:12:13 triangle. It means that the two thin white lines above, each aligned to the cardinal points of the compass, for the ’12’ side and the ‘5’ side of the triangle, and have lengths, according to Pythagoras’ theorem, of 9261 feet and 3858 feet respectively. There is no sign of any monument at the point where these lines meet, at the right angle, although a dig there may prove fruitful for anyone up for the task and who has permission from the custodians of this World Heritage site! Here’s where the application of megalithic science begins to deliver big dividends. There has so far been no digging, no invasion of the site, no massive expense and yet already this investigation is able to change the way we look at these two henge monuments, separately and as a pair. And there has been neither the harming of any archaeologists, nor employment of loony fringe ideas. Just one angle and one length accurately measured using precision instruments up to the task. There is already an existing 5:12:13 triangle implied within the 5:12 station stone rectangle, once described by Aubrey Burl as ‘near perfect’. The diagonals of this construction are 13 of the same units that make up the known and measured ‘5’ and ’12’ sides, and the three measurements are 108.8 feet 261.2 feet and 283.6 feet, respectively. 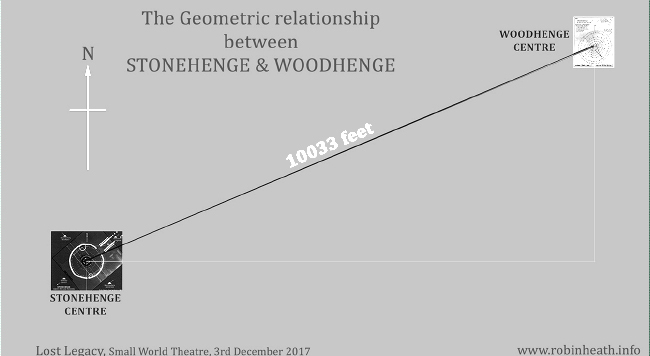 It is the 13 side of a 5:12:13 triangle that is our measured length from Stonehenge to Woodhenge, measured as 10033 feet. As they say on the sport news, look away now if you don’t want to see the result. Now for the good bit – 10035.47 feet = 283.6 x 13 x 2.722 feet. [99.98% of the measured value, using the later value for the megalithic yard determined by Thom during the 1973 Stonehenge survey (Thom, JHA,1974, op cit) and confirmed by the Avebury survey of 1975 – 6, (Thom & Thom, MRBB 1978, op cit, pp 36-43)]. Thus it appears, based on this first step in investigating the relationship between Stonehenge and Woodhenge, that these two henges relate to each other, through a fundamental measurement of the Aubrey circle, namely its mean diameter (Thom, 1974, JHA, op cit), which is fundamentally and intelligently incorporated into the distance that separates their two centres. That is enough for the first part of this article. Result.